Samsung SmartThings products can help you turn your home into a smart home, and Amazon Alexa-enabled devices can streamline the process. Learn everything you need to know to connect Alexa to your SmartThings devices. 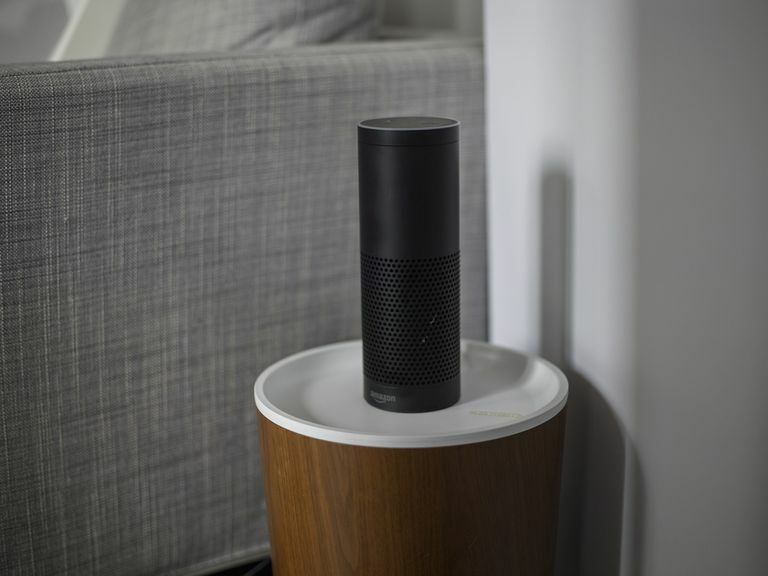 In order to use SmartThings with Alexa, you need to have an Amazon Echo, Echo Dot, or Amazon Tap. Alexa can be used to control SmartThings light bulbs, on and off or dimmer switches, thermostats, and locks, as well as routines with lighting, switch, and thermostat devices. You can use multiple Alexa devices that are on the same Amazon account to control SmartThings devices throughout your home. However, you can currently only control SmartThings devices at a single location. Before you begin the connection process, you will need to make sure Alexa is ready. If you have not yet done so, set up your Amazon Echo or other Alexa-enabled device. In addition, downloading the Alexa app will help you set up the connection and control your SmartThings products. You should also download the SmartThings mobile app and create an account. Finally, turn on Smart Home Skills in the Alexa app. Tap Devices in the bottom right corner of the Amazon Alexa app. Tap Your Smart Home Skills on the Devices screen. Tap Enable Smart Home Skills. The Smart Home screen will appear with a list of skills. With the apps downloaded and your devices ready, you can connect SmartThings devices to Alexa. Go to Settings and tap Connected Home. Tap Link with SmartThings under the Device Links. Enter your SmartThings account details and tap Log In. Select the location of your SmartThings device from the dropdown menu. SmartThings devices will appear in My Device List. Select the checkboxes for the objects you want to access through Alexa. Tap Authorize. The message “Alexa has been successfully linked with SmartThings” will appear. Close the window. The Settings page of Connected Home will open. Tap Devices and select Discover Devices. Alternatively, you can say, "Alexa, discover new devices." Wait while Alexa discovers your SmartThings devices. When the message Devices Discovered appears and your SmartThings items are listed in the Devices section, you can begin using Alexa with SmartThings. Any time you add new SmartThings devices to your home, change the location or otherwise modify your SmartThings items, you can update the information with Alexa. To do so, you will need to use the SmartThings mobile app. Tap Menu > SmartApps > Amazon Echo. Check the devices Alexa has access to in MyDeviceList. Tap Next. The app will notify you if any further steps are required. Routines allow you to run multiple tasks using just one command. You can save time, automate things you do regularly, and simplify lengthy processes that might be difficult to remember. You can create a routine using the SmartThings app and then giving Alexa commands to run it. You can use the default SmartThings Routines, which are Good Morning!, Good Night!, Goodbye!, and I’m Back! You can also create your own custom routines. Tap Settings > Connected Services > Amazon Alexa. Toggle the switch for Routines to On and tap Next. Say, "Alexa, discover new devices" for Alexa to recognize the new routine. Open the SmartThings Classic App. To use a routine, tell Alexa to turn it on. For example, "Alexa, turn on I'm Back." Alexa will say, "OK" and run the routine. If you have set Alexa to Brief Mode, she may not say "Okay." Instead, you may just head a musical tone to indicate she has heard your command and taken the appropriate action. By default, Alexa will have access to all of your SmartThings devices when you connect Amazon Echo and SmartThings. You can remove access to any device using the SmartThings app.